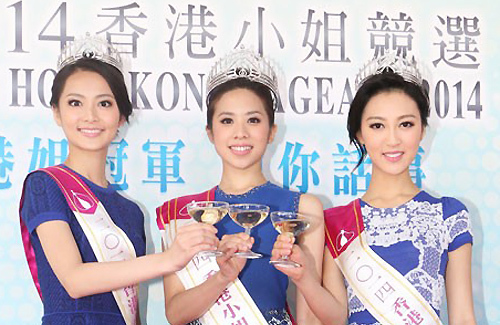 The Miss Hong Kong 2014 pageant concluded on August 31 with controversial results. Although TVB utilized a combination of votes from the public and its own judges, the winners’ victories were heavily contested. Many netizens even speculated that the results were rigged. Prior to announcing the top three finalists, TVB’s Fun App already asked voters to select the winner for the Miss Hong Kong title. It was reported that #11 Sofiee Ng‘s (吳凱欣) online votes were higher than the top three finalists’ votes. Since the contestants’ official profiles were released to the public, Sofiee was a popular choice expected to take the crown. When Sofiee failed to place in the top three finalists and Veronica Shiu (邵珮詩) was crowned, even MC Eric Tsang‘s (曾志偉) jaw dropped. Defending her second runner up title, Katherine Ho firmly reiterated that everyone already knew about the one-vote-per-person system since the start of the competition. Therefore, the results should reflect citizens’ choices. Guys, do you have the TVB Fun App? You need a HK ID with a HK address to vote. It’s not like you have a ID number and you can vote LOL. you make it sound so hard to vote, lol. Ever heard of using relatives’ addresses or using Google and using a fake HK address? Not that difficult to bypass unless TVB manually checks every voter to make sure that person lives there. Girl, you really need to use the damn app LMAO! It’s more than having the HK ID card. You also need an address and a phone number. Unless you have the leisure to lend your relative (given you so have relatives and they allow you to use it), you are stuck. You can’t vote. You may use a fake address but at the end of the day, if you get selected to win the car or any prize TVB hands out, YOU WILL GET DISQUALIFIED because you can’t prove your residency. Sounds stupid to lend the HK address right lol? Btw, you have to verify your HK phone number. They send you a text message to verify your phone number. If your relative has the phone number associated to one account, I think you can’t “re-use or borrow” the phone number. Easy said than done my friend ROFL.